Robots, aliens, and a spunky teenaged girl. 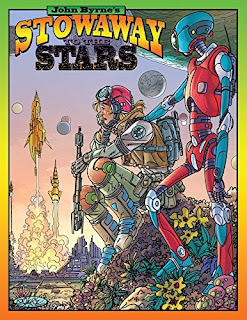 John Byrne explores a whole new way of storytelling in Stowaway to the Stars, where Byrne (Star Trek New Visions, John Byrne's Next Men) takes you on a journey through brand-new worlds and galaxies with this beautiful series of full-page, full-color illustrations, accompanied by a light, evocative, science-fiction storyline. A short story about a young girl who dreams of traveling to the stars, and one night makes the decision that she needs to fulfill this dream and stows away on a cargo ship. Of course, she's discovered and then has to work on the ship to earn her way. And of course, the ship is attacked and she is thrown into a life and death escape. And of course, she survives and makes it home, where she settles back into her routine but continues to dream of adventuring to the stars. To be frank, the whole thing is fairly predictable and there's not much meat to the story, and I don't think I'd have paid this any attention had it not been for its creator, John Byrne. Byrne was one of my favorite artists back in the day when I was collecting earlier X-Men comics. His style is distinctly his own, and always held a sort of dynamism for me. It's been a while since he produced anything new, so I was excited to pick this up, and he doesn't disappoint with his art. The story is 48 pages long, with the left hand page carrying the prose, and the opposite page carrying the art. I breezed thru the story (again, it's fairly simple), but I immediately went back and poured over each page of art. Byrne fills each page with remarkable detail, and Leonard O'Grady's colors really pop (even if there are several inconsistencies with the coloring of characters throughout the book). I'm not sure that this will appeal to a large crowd, and I don't think it's intended to. I fell that Byrne produced this more for himself than anyone else, and I'm glad that he decided to share it. It may not be the most remarkable book you'll read, but it's full of heart and soul, and that's what counts.